Last week was a wonderful time of accreditation with the combined team from ACSI and WASC! We are blessed to have two different agencies, one ensuring the merge of our faith-based worldview is full of vitality and soaked in Biblical thinking and the other focused on our academic integrity and following best educational practices. BAIS school personnel demonstrate daily their personal commitment to the mission and vision of the school. The school is commended for providing an overall environment which is safe, secure, and orderly. BAIS successfully prepares students for top universities in the USA, Australia, Korea, and Europe. BAIS provides multiple opportunities for the student body to develop a Christian worldview. In the next month or two, the full report will come out. This report will contain areas of recommendation from the committee in addition to the commendations above and more. Once we receive the full report, more details will be available for all to read. We are so thankful for the team that came. We are truly blessed and fortunate to have educational experts come and assist our community in achieving our goals. I hope to see all of you at the concert this evening. We are excited to celebrate God’s tremendous blessings through the arts and to celebrate our 10 years here in Kota Baru. See you tonight! 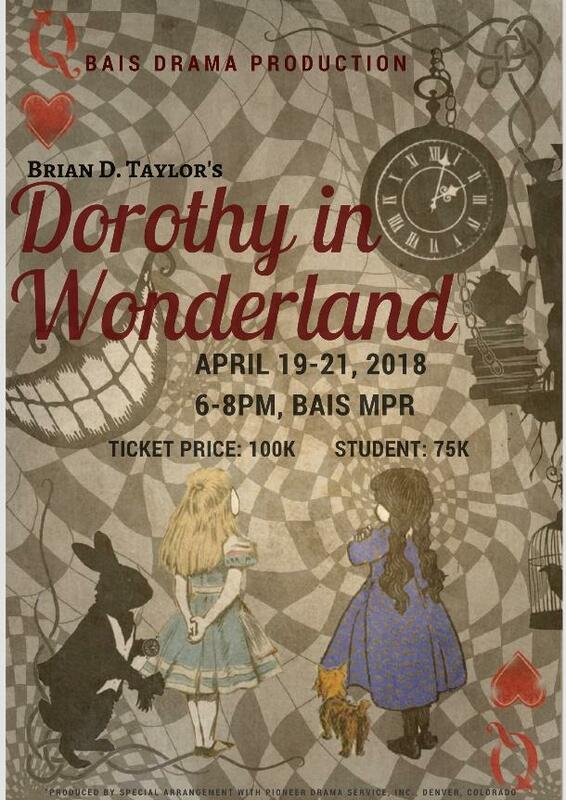 Tickets for the 2018 BAIS production of Dorothy in Wonderland will go on sale starting Monday, April 9 before school and after school under the blue covering and in the front office. There are only 100 seats available each night. So buy your tickets early! The secondary division (grades 6-12) publishes hard copy report cards for first semester and second semester only. All PowerSchool grades were updated and current as of April 2, 2018. Please see PowerSchool for your student’s second semester scores. Thank you. On Tuesday, April 10 during secondary lunch (12:21-12:57), Asbury University will give a presentation in Mr. Powers’ room. Students, as well as parents, are welcome to attend. Asbury University is a Christian university in Kentucky, USA and offers a guaranteed $11,750 scholarship for every incoming college freshman who has graduated from a NICS/Oasis school and meets the minimum requirements for acceptance. Call time for spring concert: 5:00 pm at the BAIS sports court. All piano students are encouraged to participate. One piano piece in any genre. Perform the piece from memory. 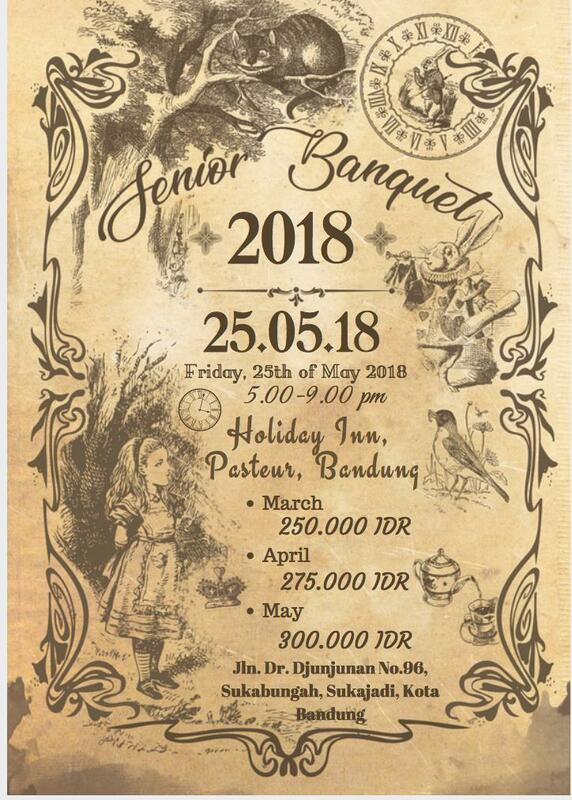 If you are interested in purchasing a ticket to the senior banquet, please contact Ms. Beth LaMertha, Ms. Hermione Zhang, or one of the members of the 11 grade. IISSAC Badminton will be April 27-29th at Wesley in Malang. 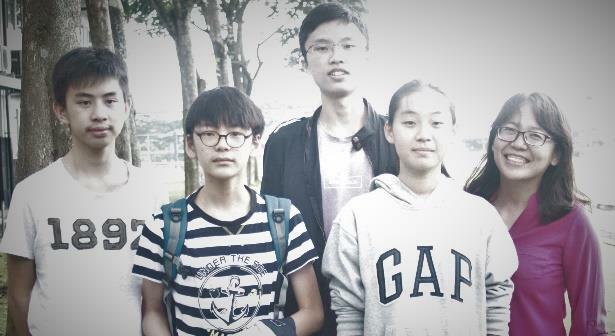 The teams need a female chaperone to accompany the BAIS teams to the competition. Please contact Mr. Powers or Ibu Dias if you are interested. IISSAC Badminton down payment is due Tuesday, April 10th. Money can be transferred or cash paid directly to Mr. Powers or Ibu Dias. If you are interested in purchasing a sponsorship, please contact Mr. Nielsen or Ibu Leony. Please come enjoy the Music Department’s Spring Concert this Friday at 5:30 on the Sports Court. Our BAIS students have been working hard this semester to put together an impressive show. Come support our BAIS community. Volunteers are needed for the BAIS Swim Invitational this Saturday, April 7th! Please contact Mt. Powers or Ibu Dias if you are interested in being a timer for the swim meet. Congratulations to Daniel Darmamulia, Devlin Kartarahardja, Sergio Limandibhratha, & Jun Seon Hong! Daniel has been accepted to the University of California, Santa Barbara in the United States. Devlin has been accepted to New York University in the United States. Make sure to congratulate these students on their hard work when you see them around campus! Just to recap, so far the Senior Class of 2018 have 86 offers of acceptances to universities and colleges in nine different countries around the world. They have been offered USD 1,409,764.00 in scholarships thus far. Thank you for praying for our students as they are making a choice of which school they would like to continue their education. And for the students that are still in the process of applying. There are still are a few countries that are just beginning or are still in the process of accepting applications. On Monday, April 9, elementary and secondary students will take the Spring Writing Assessment in their language arts classes. Please encourage your children to get a good night’s sleep and to eat a healthy breakfast so that their brains will be well-rested and energized while completing this assessment. Writing Assessment reports will be given out at Student Led Conferences on May 11. Some cases of head lice have been detected in a few elementary classes. Anyone can get head lice, mainly through direct head-to-head contact but also from sharing hats, brushes and other personal items. Head lice is a problem in many communities and does not reflect poor hygiene or social status. Please do your part to prevent the spread of this communicable condition by checking your child(ren) daily for the next few weeks and on a regular basis thereafter. Lice infestation is much easier to treat if caught early. Students who are found with lice need to stay home until the lice has been taken care of. The first opportunity to take advantage of the Early Bird discount is coming up soon. The due date for the 5% Early Bird discount is April 27, 2018. The invoices should be out within the next week but please begin to make preparations for the Early Bird payment if you want to take advantage of the 5% discount. Believe it or not, teachers learn best in the mornings too! That is why every other Wednesday, BAIS students begin school 75 minutes later than usual, starting school at 9:00 A.M instead of 7:45, Thereby enabling the professional development of our staff. This valuable time built into the schedule allows teachers to continue learning the art and science of education, modeling the idea of being a lifelong learner. Teachers are able to keep current with technology, teaching strategies, and classroom management techniques. Next week, we will have a visiting professor from Taylor University come and spend time teaching our teachers. Dr. Cindy Tyner is the chair of the Education Department and has spent a lifetime in education both at the elementary and university levels. She and her husband, Stan, are both lifelong teachers and have a wealth of experience to share with our team. Thank you BAIS community for allowing our teachers to remain current and sharp in their profession. The Late Start program is a great benefit to our teachers, thus strengthening the overall BAIS program. 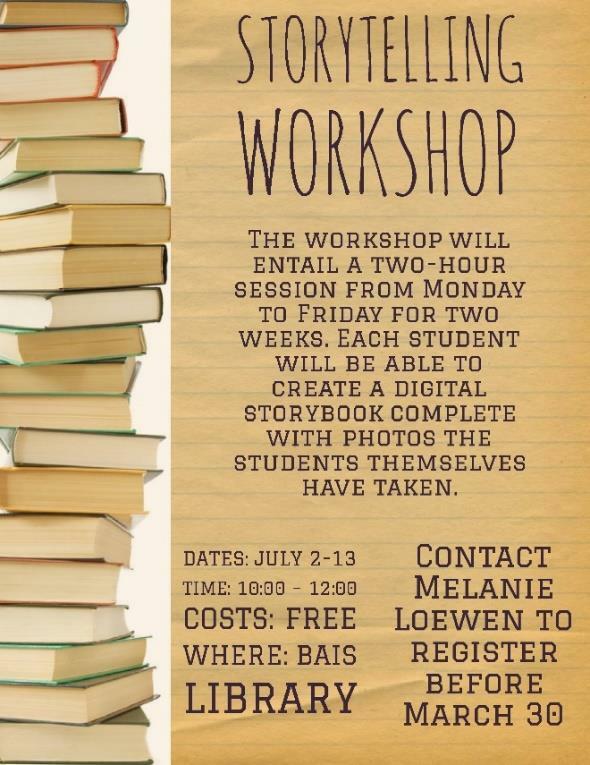 If your student has not yet taken their school ID photo, there will be one last opportunity for them to do so for this school year.